chevron continuously makes progress on the business today top 30 business entities list | Welcome to Chevron Lubricant Lanka PLC. Chevron Lubricants Lanka PLC is ranked in the 17th position of Business Today – Top 30 business entities for the year 2016 / 2017. The business Today magazine recognizes Sri Lanka’s top private sector businesses under its annual “Business today Top 30” awards. As a ‘single-business’ entity the company has steadily climbed through the ranks over the years. The company ranked in the 19th position during the year 2014 / 2015, progressed to the 18th position in the year 2015 / 2016. The continuous progress on the ranking is a tremendous achievement for Chevron, as the company is among the few if not the only business entity on the list, operating in a ‘single line of business’; apart from the banks. Business Today – TOP 30 Awards are presented in recognition of the top corporate performers in Sri Lanka at an annual ceremony. This year’s award ceremony was held on the 20th of November at the Shangri-La ballroom, under the auspices of the Prime Minister Hon. Ranil Wickremesinghe, and many distinguished invitees including distinguished government ministers and top corporate leaders. Despite the market for lubricants becoming increasingly challenging and the recent market liberalization further intensifying the competition, the company continues to perform meeting the expectation of the investors and the stakeholders. Chevron Lubricants PLC is the leading supplier of world-class lubricant brands Caltex, Havoline and Delo. 51% of Chevron Lubricants Lanka PLC is owned by Chevron corporation, USA. The company is strengthened by the world class cutting-edge technology and a network of lubrication specialists who deliver products and customized services. 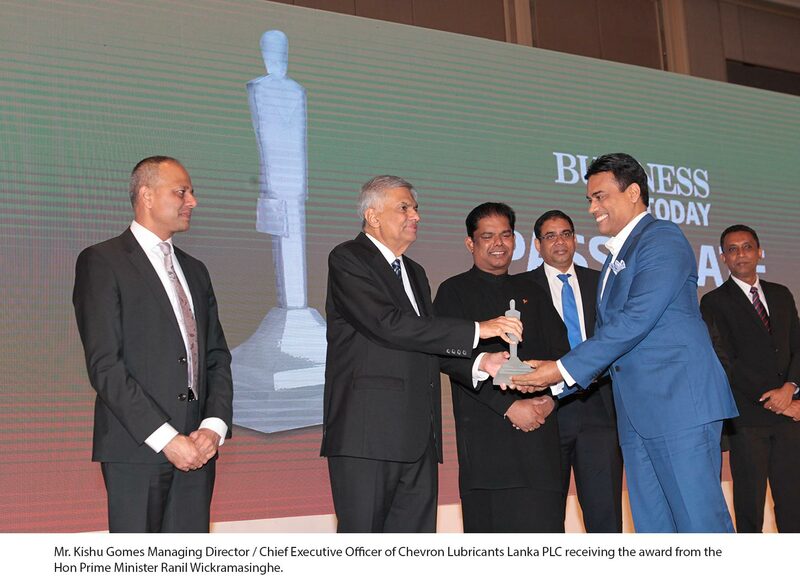 Chevron Lubricants Lanka PLC is the highest-ranking company in 2016 / 2017 Business today – Top 30, in the lubricants sector. The Company’s knowledge of the local business environments and its broad experience of operating in a wide array of countries provide local know-how on a global scale, combined with the strength of Chevron global helps in delivering outstanding results. The company continues to originate industry benchmarks of excellence and has established a strong consumer franchise both locally and globally. Being the leader in the lubricants industry for over two decades, with the highest outlet penetration in the industry, Chevron Lanka delivers its portfolio of world-class products and services to thousands of Sri Lankans even in the remotest regions of the island. The company also supplies lubrication solutions to many industrial suppliers and government entities such as the Ceylon Electricity board and Sri Lanka Railway, which provides essential services to millions of Sri Lankans. Chevron Lubricants Lanka PLC continuously strives to deliver the best results for its stakeholders and to make significant contributions towards Sri Lanka’s national prosperity through contributions to the national economy and corporate social responsibility initiatives.